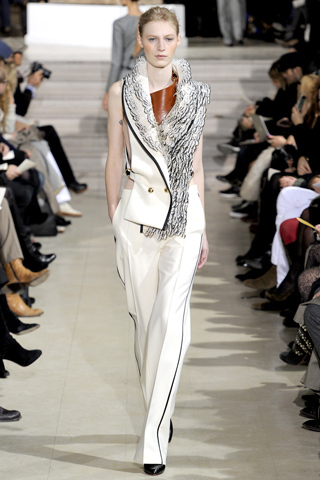 Bouchra Jarrar is our pick today. I think since so many of us sewists have decided that 2012 will be the year of well-fitting pants- this designer should be on our radar. If a well-teased collar is your goal- also take note. Where is that draft coming from??? I like. I know- they don’t have irridescent crotch wings or cantilevered shoulder cannons, but still, this is nice. These are outfits to seduce the office mailboy in. This is how madonna’s Mother would like her to dress, I’m sure. I am in LOVE with all of those pants! Me too! I almost want to wear adult clothing to work now! Beautiful collection – gorgeous colours and totally wearable. Great choice, thanks and loads of inspiration for our own humble offerings. Seriously achievable goals here- I’m so pleased to see some old school basics in such a flattering way. Very wearable collection….I found the stripe detail on some pants interesting…sort of like a secret code for people who exercise in “the perfect workout outfits”….Love the sleeveless black one….thanks for sharing. I think it elongates the leg- thats why Robert Preston looked so hot as Professor Harold Hill! I would never be able to wear them, but I love those white pants! I could do without the oddly shaped collars though. You don’t want a wonder weasel collar? I don’t understand. What struck me about this was how pretty all the models look! Very wearable and classic. It’s like they did a search for perfect cheekbones…. Oh and the little clips under their heads making it look like they were biting a paw to stay on those society matron shoulders! Roadkill can be very distracting, almost as distracting as the red soles….. I want all of those pants for my school wardrobe! Just lovely! 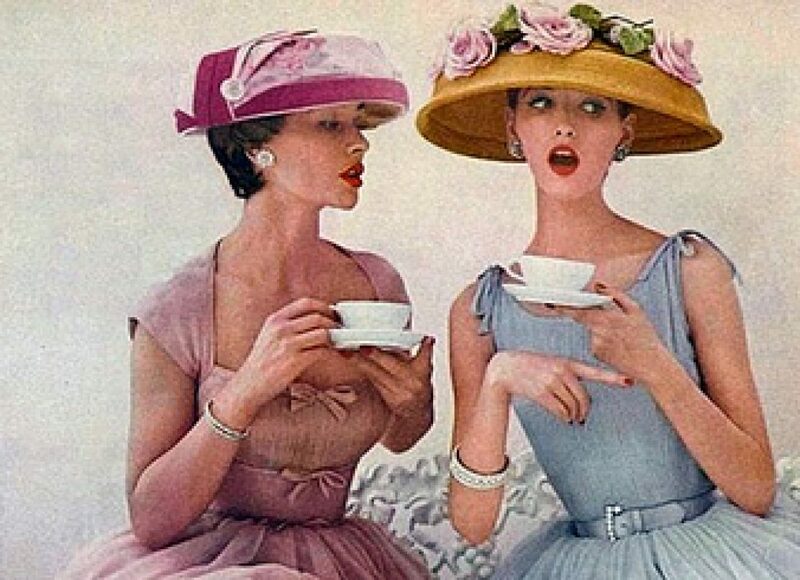 These are all wonderful, and I’ll just ignore the first poor model with the large caterpillar on her neck. Gawd, I’m in love with this collection. Everything is so wearable and I have to disagree with Mary – I’d take that caterpillar in a second. It looks amazing on that model and I only wish I had her height to pull that piece off. Ok, I’m totally a fur freak, so I would wear that first outfit no problem! It just would be nice to be completely hip-less like those models. I think their shapelessness makes the pants look good. You notice the pants first, whereas on me, you notice the shape inhabiting the pants first, and that makes a beautifully tailored pair of pants an afterthought, unfortunately.